All of us at SMSA have been saddened to hear of Gough Whitlam’s passing. We can confirm that this talk will take place as scheduled with the intention of respectfully honouring Gough’s lasting legacy to Australia and his wife Margaret, who made it possible. Susan Mitchell’s newest book, Margaret and Gough, unveils the compelling story of former Prime Minister Gough Whitlam, his wife Margaret and their 70-year relationship – personal and political, private and public – revealing how two extraordinary people, side by side, led the Australian nation into an exciting and turbulent new era. Gough had no small talk, Margaret had the gift of easy conversation. He was often ill-at-ease in company and preferred his books. She was warm, inclusive and jollied him along. He had a vicious tongue and a quick temper. She always tried to see the best in people. He knew everything about the ideology, history and heroes of the labour movement. She trusted her instincts. He may have passed the laws that changed the nation, but she made it possible. The strength and endurance of this remarkable relationship helped change our nation politically, culturally and socially. Margaret and Gough is a story of love, respect, struggle, success, failure, disappointment and resilience, and a partnership where the political was always personal and the personal was always political. Dr Susan Mitchell is an Adjunct Professor of Creative Writing at Flinders University, a radio and television broadcaster, columnist and public speaker. She has published fifteen books documenting, narrating and analysing all aspects of Australian society, particularly the role of women, starting with her bestselling Tall Poppies. Her other books include The Matriarchs, Icons, Saints and Divas, Margaret Whitlam, Stand by Your Man and the polemic Tony Abbott: A Man’s Man. She has presented radio programs on the ABC and commercial networks and her own television program, Susan Mitchell: In Conversation. 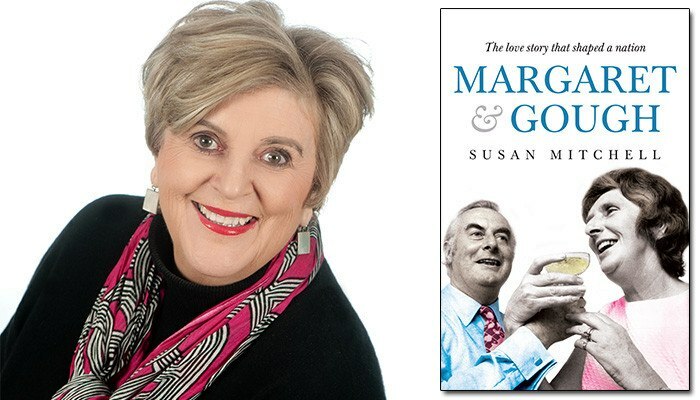 Join Susan Mitchell for an view inside a compelling love story that shaped a nation; the story of Margaret and Gough Whitlam’s 70 year partnership. Opposites in many ways, the Whitlams brought out the best in each other. They saw each other as equals and never hesitated to express their different viewpoints. Neither Gough Whitlam nor Margaret Dovey would have developed into what each became without the influence of the other. Through every major political change, every election campaign, every triumph and every loss, they stood together. He may have passed the laws that changed the nation, but she made it possible. Moved to Mitchell Theatre due to popular demand. Please book to secure your seat. FREE – Bookings are essential.